The Good Doctor wanted to catch up over lunch, and decided to take me to one of his favorite sushi joints. I don't eat much sushi in Hong Kong, so I'm unfamiliar with most outlets in town. I've heard people talk about Sushi Kado (角) before so I was happy to check it out. But first I decided to do a little homework, and the first piece I read was from 2 years ago on Fungry and Fabulous. Lynn's conclusion was that the flavors were much too mild and that Sushi Sase (鮨佐瀬) would always be a better choice. I kept that in mind as I sat down and waited for lunch to start. I ordered the seasonal sushi set (板前寿しセット), which comes with 12 pieces of nigiri sushi (握り寿司) and a roll (巻物). I specified - as I usually do - that I do not eat any form of tuna. First comes a bowl of salad. It's always good to get some greens in. Then came the seemingly obligatory steamed egg custard (茶碗蒸し) with crab. A nice a premium version with sweet crab meat, along with a touch of ginger in the custard. Olive flounder (鮃) - with some shaved yuzu (柚子) zest on top in addition to soy sauce. Striped beakfish (石鯛) - this was a little chewy. Japanese halfbeak (細魚) - with a sprinkle of ground pink rock salt and a squeeze of lime. Pacific saury (秋刀魚) - the Good doctor discussed with Chef Jason about the saury being smaller this year, and leaner. 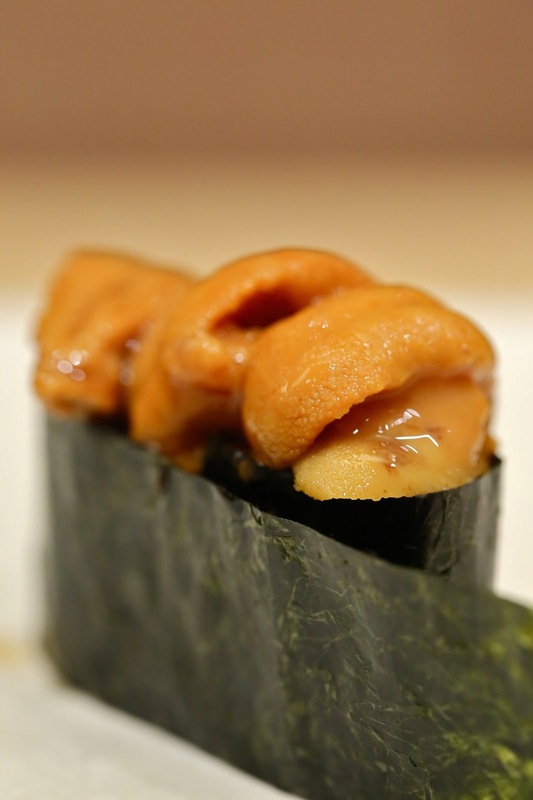 Surf clam (北寄貝) - never had it grilled like this, making the texture softer than I'm used to. 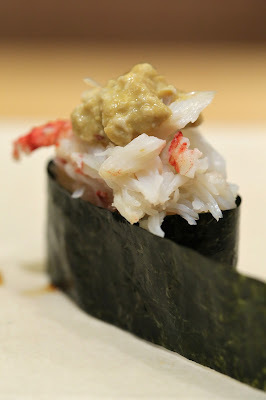 Japanese horsehair crab (毛蟹) with crab tomalley (蟹味噌) - just love this... especially the addition of crab tomalley. Striped jack (縞鰺) - grilled to give that smoky flavor. Rockfish (喜知次) - torched. Very tender as expected, and very oily. Substitute for fatty tuna belly. Conger eel (穴子) - with a little bit of grated yuzu zest between the rice and the eel. Egg (玉子) - way too wet and soggy. Not a fan. Plum and perilla roll (梅紫蘇巻き) - substitute for the chopped tuna roll.